Alice King, of Lawrence, load pies Wednesday into paper bags to complete the LINK Thanksgiving meals to be delivered Thursday. She and her husband, Jim King, were among the volunteers who prepared a record 600 LINK meals a Maceli's for home delivery this year. 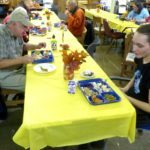 As she prepared to dig into a piece of pecan pie early Thursday afternoon at the Lawrence Interdenominational Nutrition Kitchen’s annual Thanksgiving dinner, Samantha Pettyjohn was thankful she didn’t have to spend the holiday alone. Across the table from Pettyjohn was Dale Cannon, who drove over from Topeka to enjoy the LINK dinner in the basement of the First Christian Church, 1000 Kentucky St.
Cannon and Pettyjohn gave thumbs up to the meal of turkey, dressing, mashed potatoes, green beans, cole slaw and pie, which more than 100 people had enjoyed in the basement less than an hour after the doors of the First Christian Church opened to diners at 1 p.m. By that time, a record 600 LINK Thanksgiving meals already had been delivered to Lawrence homes, said Deb Engstrom, LINK Thanksgiving meal organizer. 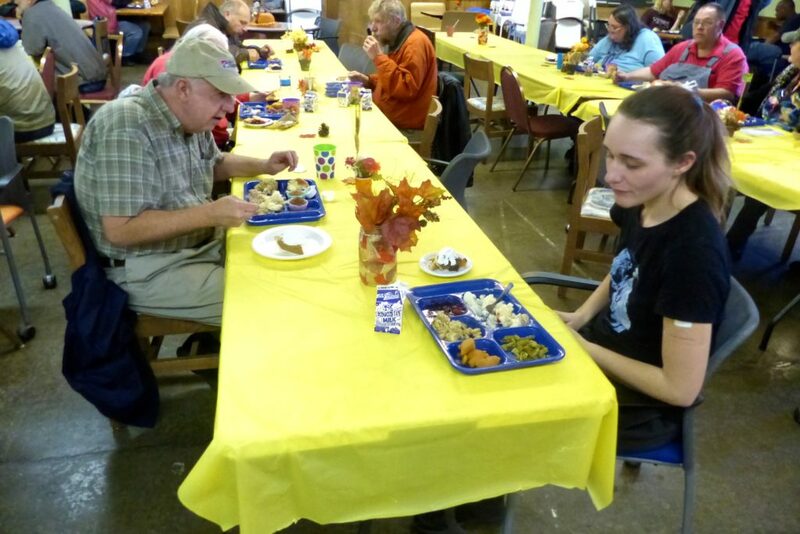 Dale Cannon, of Topeka, (left) and Samantha Pettyjohn, of Lawrence, enjoy LINK Thanksgiving meals Thursday in the basement of the First Christian Church, 1000 Kentucky St. The two said they were grateful for the food and company on the holiday. Volunteers make the logistics behind the LINK Thanksgiving meal work, Engstrom said. LINK contracts with Maceli’s to cook the turkey, but volunteers cook the rest of the fixings at home, dropping off the food at Maceli’s the day before Thanksgiving to be packaged for home delivery and stored for the meal at First Christian Church. Steve Maceli, who owns Maceli’s, said the business donates its facilities and its coordinating expertise for the delivery effort. 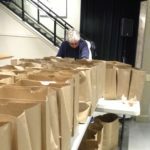 The volunteer response for the annual meal was overwhelming, he said, noting the effort could use more food donors. On Wednesday afternoon, Nancy Amison, of Lawrence, was among the volunteers at Maceli’s helping prepare meals for home delivery. Her job in the assembly line process was to slice pies and place them in white foam packages. It’s not difficult to get volunteers, said Brenda Gale Allen, who estimated she has helped Engstrom assign meal delivery routes for 15 years. 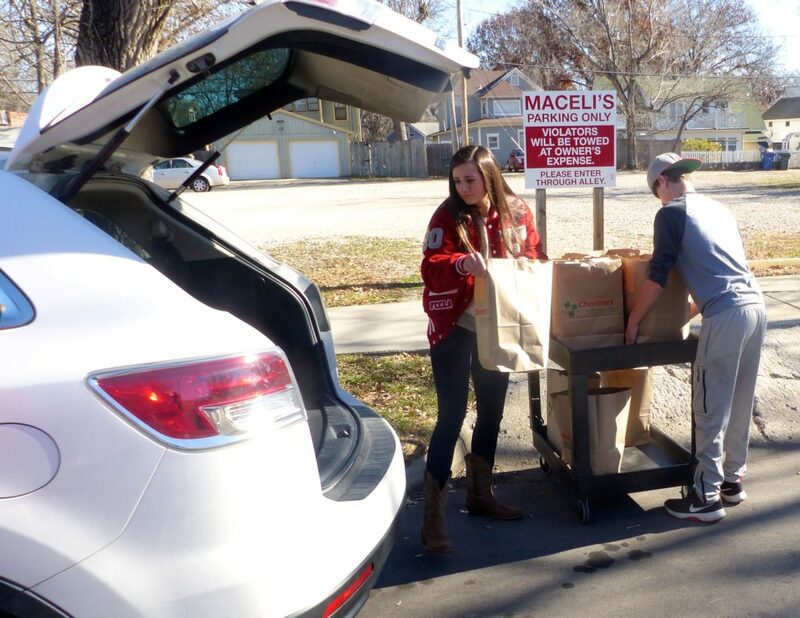 Olivia Kennedy, 15, of Frankfort, and Cody Andrews, 14, of Tonganoxie, load LINK Thanksgiving meals for home delivery Thursday at Maceli's in downtown Lawrence. Kennedy was visiting her Lawrence family, who has made a Thanksgiving tradition of delivering the LINK meals. Andrews was a volunteer at Maceli's were 600 meals were prepared for home delivery this year. As she helped serve meals Thursday at First Christian Church, Helen Sedge, of Lawrence, said volunteering at the Thanksgiving meal was something she had wanted to do for a long time. As he enjoyed his dinner, Mark Thompson, of Lawrence, said he was grateful for all those who made the meal possible. 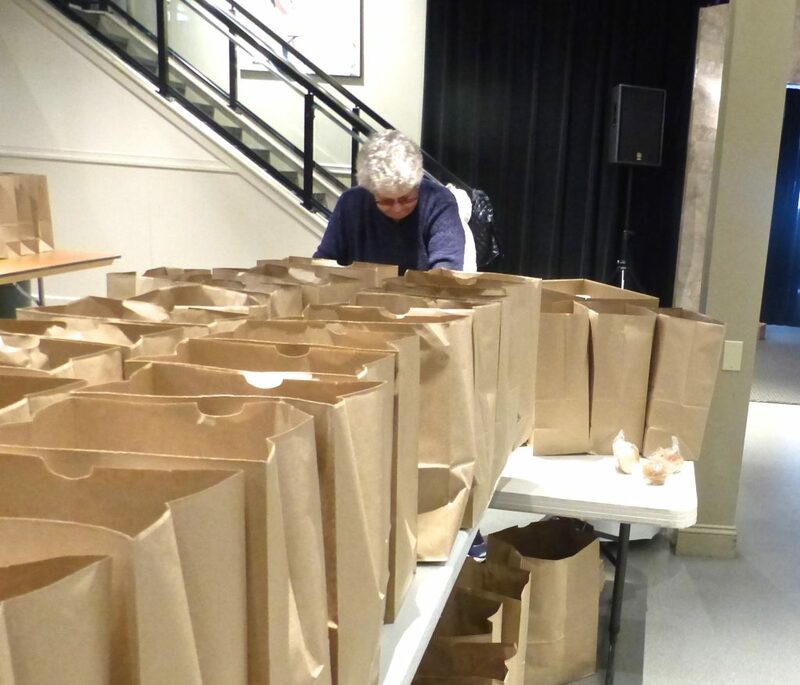 Alice King, of Lawrence, load pies Wednesday into paper bags to complete the LINK Thanksgiving meals to be delivered Thursday. She and her husband, Jim King, were among the volunteers who prepared a record 600 LINK meals a Maceli’s for home delivery this year. Olivia Kennedy, 15, of Frankfort, and Cody Andrews, 14, of Tonganoxie, load LINK Thanksgiving meals for home delivery Thursday at Maceli’s in downtown Lawrence. Kennedy was visiting her Lawrence family, who has made a Thanksgiving tradition of delivering the LINK meals. Andrews was a volunteer at Maceli’s were 600 meals were prepared for home delivery this year.